Figure 7.32 Stratigraphic nomenclature for the Maastrichtian and Paleocene of parts of Alberta and southern Saskatchewan. North Dakota) lies within the upper part of magnetostratigraphic subchron C29r. The extinction of Aquilapollenites pollen marked the boundary. Lerbekmo (1985) repeated these results in the Frenchman Valley (Cypress Hills area; locality 75) in Saskatchewan. Figure 7.33 Photographs of the K-T boundary in the Scollard Formation at the Red Deer Valley locality in Alberta. Arrows point to the boundary in the distant (a) and close-up (b) views. In "b" a plastic spike has been driven into the boundary claystone layer, which is at the level of the arrow point and the hammer handle. Laevigatosporites (but see results of subsequent studies in the vicinity of the Morgan Creek locality by Sweet and Braman 1992, discussed later). Nichols et al. (1986) took the presence of the fern-spore spike to confirm the work of Tschudy et al. (1984), who had concluded that the phenomenon was of continent-wide extent. 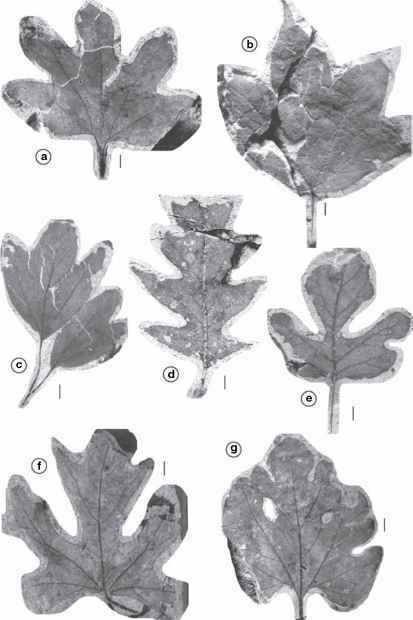 Beginning in 1986, a series of papers by Canadian palynologist Arthur Sweet and colleagues were published that described new localities in western Canada. Here we summarize the new data, and their interpretations that differ from those based on the studies from New Mexico, Colorado, Wyoming, Montana, and North Dakota. 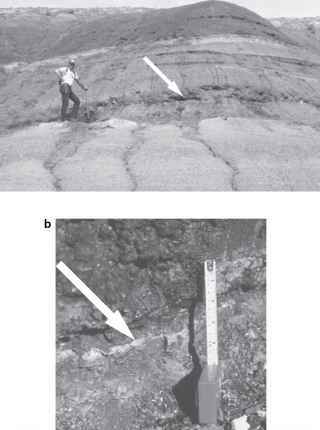 Figure 7.34 Photographs of the K-T boundary at the contact between the Frenchman Formation (below) and the Ravenscrag Formation (above) at the Morgan Creek locality in Saskatchewan. 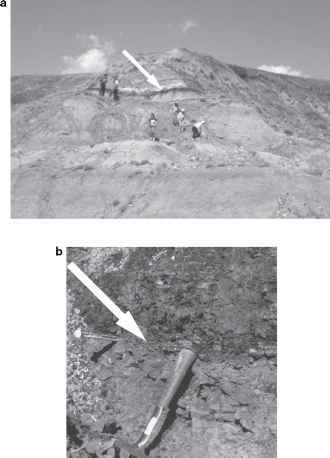 Arrows point to the boundary claystone layer seen at a distance (a) and close-up (b) and the basal coal bed of the Ravenscrag is visible a few centimeters above it in "b" (scale in centimeters and inches).